Here is another Swiss cover to share with you. It is my second cover from this lovely country. Franked on the left of this cover are 2 se-tenant stamps issued in 1971. The set of 6 stamps is shown below. Next, we have a stamp issued by Swiss Post for its Europa (CEPT) stamps in 1984. The theme for that year was "Bridges and Tunnel". 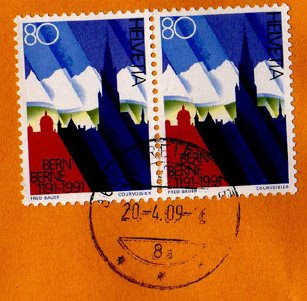 The pair of stamps on the right of the cover was issued in 1991 to commemorate the 800th Anniversary of the founding of Berne city. The city of Berne or Bern is the fifth most populous city in Switzerland (after Zurich, Geneva, Basel and Lausanne). 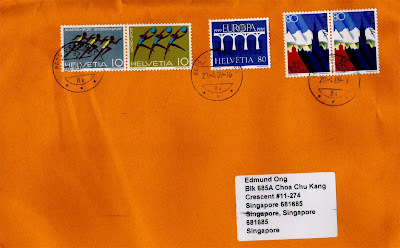 This cover was postmarked on 20th April 2009 in Greifensee (approximately 12 km to the east of Zurich in Switzerland), and took 9 days to travel an estimated distance of 10,285kms.